Last weekend, October 14th and 15th, I took part in the Pediatrics Advance Life Support (PALS) course. This is a challenging and satisfying certificate which I look forward to every few years. Completion of PALS involves review and demonstration of various knowledge and skills as both a team member and as the lead. There are many areas of individual growth in this certificate as health care providers (HCP) deal with a wide age range of patients, from neonatal to young adolescent. 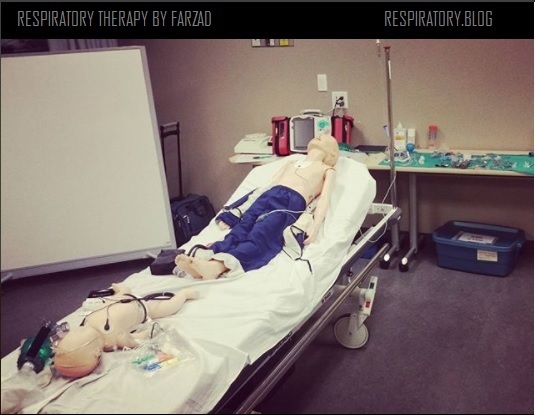 Also, the topics covered include, but are not limited to, Systematic Assessments, Respiratory Distress and Failure, Bradycardia, Tachycardia, Cardiac Arrest, Shock (Hypovolemic/Distributive/Cardiogenic/Obstructive), and Post-Resuscitation Care. Since many health concerns of children include respiratory components, PALS offers Respiratory Therapists a good chance to review their knowledge and skill-set. Aside from the knowledge and hands on opportunities, there is a chance to work within inter-professional teams. PALS helps HCP’s see scenarios from different angles and roles. By better understanding the roles, team members can more effectively understand, anticipate and participate in the flow of patient care. Reviewing the systematic approach in PALS is a mindset that can also be applied in adult populations and during Rapid Response Team assessments and interventions. As a new graduate, one of my biggest challenges was attending to Rapid Response Calls. The on-call Nurse and RT would reach the bed side first and would begin the quick assessment and at times, when appropriate, would initiate the required intervention even before the attending doctor would get there. This certificate allowed me to better identify, organize and classify the available information, better narrow down the plausible causes, and provide better interventional care. When compared to ACLS and NRP, PALS is usually not a required certificate in job postings, thus new graduates can better stand out when equipped with this qualification. Even for RTs who have a few years of experience, completing this certificate can demonstrate a willingness and drive to learn and to improve. This certificate is a useful asset and thus it is my personal recommendation to RTs and other HCPs to take their PALS.